Cruising to the Arabian Gulf offers travelers the opportunity to experience so much within one voyage. It’s one of the most diverse regions in the world, home to desert sinkholes and towering skyscrapers, ancient souks and flashy shopping malls, luxury golf courses and Bedouin camps. This destination truly offers something for everyone. But one thing everyone is bound to enjoy is the cuisine. Arabian food is simply divine! On October 24, 2016, we’re embarking on what’s bound to be an incredible voyage to the Arabian Gulf and Emirates. Azamara’s President and CEO Larry Pimentel will be onboard, along with our Le Club Voyage Ambassador Nicole Lukacs and members the Le Club Voyage loyalty program. We know we’ll be keeping this handy guide to local cuisine in our back pockets throughout the voyage. 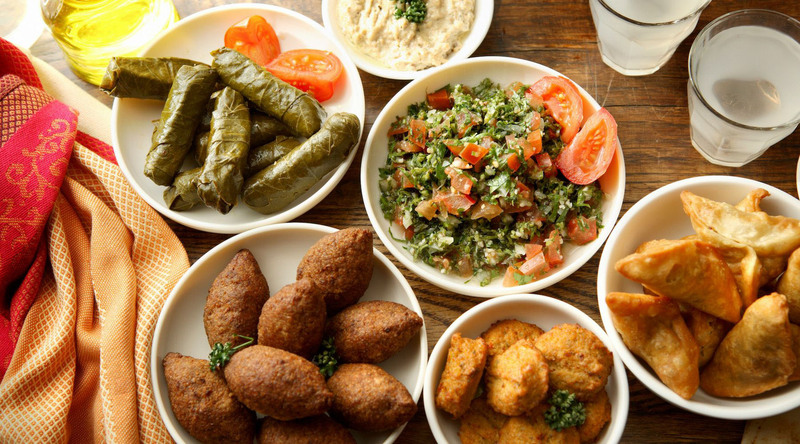 Arabic dishes like hummus, falafel, and kebabs are popular worldwide and are served across the Middle East. They belong to Levantine cuisine, the traditional food of the Bilad ash-Sham region – today, known as the modern states of Jordan, Lebanon, Palestine, Israel, Syria and Southern Turkey. The most distinctive aspect of Levantine cuisine is mezze, small dishes served at the beginning of a multi-course meal. Though Levantine cuisine is both popular and influential, it is not the traditional food of every Arabian country. The United Arab Emirates is home to the cosmopolitan cities of Dubai and Abu Dhabi. Here, you’ll find the cuisine to be creative and globally inspired. Michelin-starred chefs from around the world have opened restaurants in Dubai that cater to the city’s large expat population. In classic Emirati cuisine, camel meat was reserved for special occasions like weddings or Eid-al-Fitr – a religious holiday that marks the end of Ramadan. You'll see it on the menu at most traditional restaurants. Lamb and seafood stews are popular. If you enjoy fish, try jasheed, a traditional dish of minced shark meat with onion, spices, and rice. The cuisine of Qatar has predominant Arab, Iranian and Indian influences. The national dish is called machbous and features basmati rice, pine nuts, raisins, onions, tomatoes, and a mix of spices with mutton, chicken or fish. Mathrooba and margooga are two other popular traditional Qatari dishes. Mathrooba is traditionally eaten to break the fast of Ramadan and is a rich, buttery porridge-like chicken dish. Margooga is a hearty and healthy stew of meat, eggplant, carrots, and spices. It’s usually enjoyed with a piece of farrago bread. Oman is a small country on the Arabian Peninsula. Its geographic position at the crossroads of Asian and African trade routes has resulted in a distinctive cuisine that has many influences – North African, Persian, Arab, and Indian. Dates and seafood are Oman’s most common local ingredients and the cuisine relies on imported ingredients like black limes, coconut milk, and clove. Omani coffee flavored with cardamom, called Kahwa, is integral to local culture. Visitors are held in high esteem and hospitality is of the utmost importance. Kahwa is always served to guests, typically with traditional sweets. Bahrain is a small island and imports most food items, but local crops include fruits like dates, bananas, citrus fruits, pomegranates, and mangoes. In Bahraini cuisine, look for fresh, local fish served with rice, like grouper, rabbitfish, and mackerel. Other popular Bahraini specialties are khubz flatbread and qoozi - lamb stuffed with rice, onions, spices and boiled eggs. Foodies will love the Azamara Shore Excursions tour options available on our upcoming LCV voyage. In Dubai, guests can tour the city’s vibrant markets with the Azamara Journey’s talented Executive Chef. In Muscat, guests have the unique opportunity to shop at the historic Seeb Souq, select traditional ingredients, and enjoy lunch with a local Omani family at their home. There’s no better way to get to know a culture than by sharing a meal with new friends. In Al Manamah, guests can tour the local souq, fish, and produce markets before attending a Bahraini cooking class in the capital city of Muharraq, and enjoying lunch at a restaurant in the city’s historic quarter. From high teas at luxury hotels to traditional barbecues at Bedouin camps (not to mention the incredible food onboard as well), an Arabian voyage will delight your taste buds.